Macroeconomics is the first text to truly reflect today’s macroeconomy. In this teachable, coherent book, the author makes complex topics easily understandable for undergraduates and combines innovative treatment of both the short run and the long run with a strong emphasis on problem solving. Charles I. Jones is the STANCO 25 Professor of Economics at the Stanford Graduate School of Business and a Research Associate of the National Bureau of Economic Research. Professor Jones has been honored as a National Fellow of the Hoover Institution, a John M. Olin Foundation Faculty Fellow, and an Alfred P. Sloan Foundation Research Fellow. His research has been supported by a series of grants from the National Science Foundation. 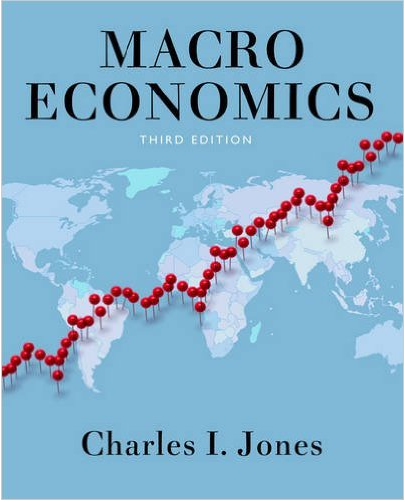 Professor Jones is the author of numerous research papers as well as two textbooks, Introduction to Economic Growth (2013) and Macroeconomics (2014). He graduated from Harvard College in 1989 and received his PhD from MIT in 1993. Charles I. (Chad) Jones is an economist noted for his research on long-run economic growth. In particular, he has examined theoretically and empirically the fundamental sources of growth in incomes over time and the reasons underlying the enormous differences in standards of living across countries. In recent years, he has used his expertise in macroeconomic methods to study the economic causes behind the rise in health spending and top income inequality.